Professor Jacob Norris is a Lecturer in Middle East History at the University of Sussex who has researched extensively on Bethlehem, Palestine. He is currently working on the Planet Bethlehem Archive to preserve the heritage and culture of Bethlehem. I will be asking him about why history is so important to Palestinians but even more crucially why the history of a Palestinian town like Bethlehem is of such vital significance to the rest of the world. What would you say to those who believe that Palestine was a remote underdeveloped land before the British mandate? Nonsense. That question would never be asked about Egypt or Syria. Of course, a complex society and rich culture existed. Palestinians today feel they need to use history to prove their connection to the land because sadly it is constantly being challenged on all fronts. In 1867 Mark Twain visited the Holy Land describing it as “A desolate country”. Zionist writers often use this to promote the idea that Palestine was backward and sparsely populated before their arrival. But this should be put into context, Mark Twain visited during a year which had suffered a terrible drought at the height of a very hot summer. He also painted a similar portrait of Greece, “We saw no ploughed fields, very few villages, no trees or grass or vegetation of any kind”. The town of Bethlehem which produced many merchants who voyaged across the globe returning as very wealthy men during the last quarter of the nineteenth century up until the beginning of the British mandate is not known to many outside of Bethlehem and its diaspora. A history which could have been lost between competing narratives. Could you describe your Planet Bethlehem Archive. I read its primary aim is to preserve Palestinian identity. Could you expand on this? It has been described as an archive of 'resistance'. Please could you also expand on this? The Planet Bethlehem Archive will be a digital archive. It’s web page will be interactive allowing users to upload for example family pictures or help identify someone in an existing picture. Primarily it will be a means for the Diaspora to maintain a connection with their heritage and culture. You could call it an archive of ‘resistance’ not in the traditional sense of the word. In Arabic the word ‘sumud’ is used to describe remaining rooted in the land despite the numerous daily trials that the Palestinian people face. By preserving Palestinian culture and heritage it will strengthen their ties to the land. Bethlehem is a great model of coexistence where for over a millennia Muslims and Christians of varying denominations have lived side by side in peace. At the same time it is a place that is not only important to it residents but to all of us because of its great religious significance. Bethlehem is not only part of Palestinian heritage but it’s part of the world’s heritage. Unfortunately, like the rest of the Palestinian territories life is very difficult for Bethlehem’s residents, it lies in the shadow of the huge wall constructed by Israel. This wall cuts it off from Jerusalem which is important economically, culturally and spiritually for Christians and Muslims. It is surrounded by the ‘By pass roads’ constructed for the settlers which Palestinians are not permitted to use. Residents movements are even further restricted by Israeli check points where they must stop to show their ID’s. All this takes a huge toll psychologically and hinders economic activity. Slowly Bethlehem is being emptied of its residents. Those who have a means of escape do so. There are the three poverty-stricken refugee camps that surround Bethlehem whose residents are unable to leave. But if the process continues Bethlehem will eventually become an archaeological remain surrounded by refugees living in abject conditions. The heritage of its people will be lost to the world. Don’t get me wrong I love Bethlehem. I love its people, they’re imaginativeness and resilience. I love visiting the town and spending time there. Its loss would be a great one for humanity’s shared heritage. 3. Could you tell us about the book you are working on at the moment? During my research of Bethlehem under Ottoman rule I came across much evidence that illustrated that this was a time of great mobility for the people of Bethlehem when they were able to voyage to all corners of the globe without restrictions and then return home, sadly this is not the case today. Among these traveling merchants there was one whose fascinating tale stood out. His name was Gubrail Dabdoub and his life is the subject of the book I am working on at the moment. Dabdoub a native of Bethlehem, was a merchant who lived for extended periods in the Philippines, France, the U.S and Honduras. In 1909 while in Bethlehem it was thought he had succumbed to typhoid. 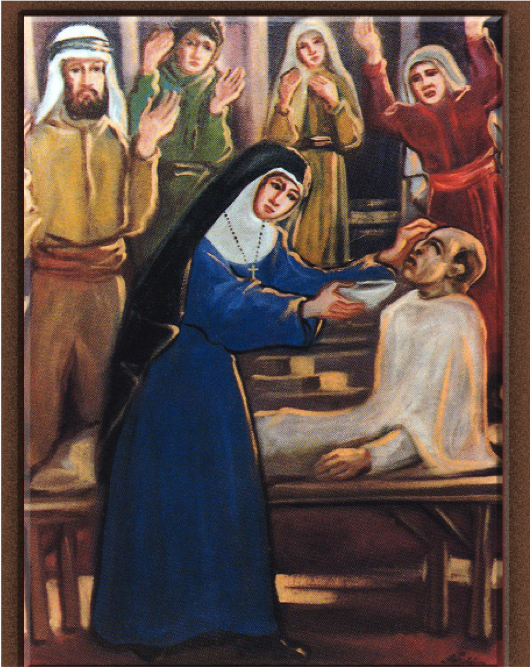 A priest had been called to administer his last rites when it is believed a native nun, Mariam Ghattas performed a miracle by bringing him back to life. He went on to live an eventful life for a further 22 years. Mariam Ghattas was beatified by Archbishop Angelo Amato on behalf of Pope Benedict XVI in 2009 and canonised on May 17th 2015 by Pope Francis. A truly miraculous tale of a man from a Holy town. Dr Jacob Norris is a social and cultural historian of the modern Middle East. He completed his PhD in 2010 at the University of Cambridge where he spent a further 3 years as Research Fellow, before coming to Sussex in 2013. Jacob's research is mostly focused on Palestine in the 19th and early 20th centuries, albeit within global and transnational frameworks. His monograph, Land of Progress: Palestine in the Age of Colonial Development, 1905-1948 was published in 2013 by Oxford University Press. From 2017-19 he is the holder of an AHRC Leadership Fellowship titled 'Merchants and Miracles: Global Circulations and the Making of Modern Bethlehem'. The Fellowship will produce a digital archive documenting Bethlehem's transformation in the 19th and 20th centuries as a result of its residents' global circulations, as well as a monograph on the global journeys of one merchant from the town.